I made this cake for my lil sis Aline. It’s a cake to celebrate her 12th birthday. And I chose this Almond Strawberry Cake, because she loves strawberries. I also know she loves pink. 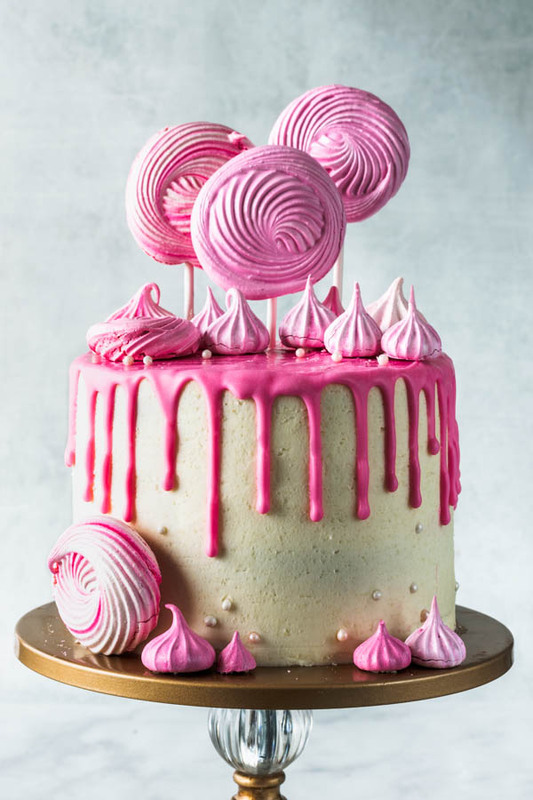 So I made a pink cake that is fun and will match her personality. Aline is a super fun, creative girl. She is really good in arts, and design. And not to mention that not only she is fun, but she is funNY! Her sense of humor is the best (and I probably think that because her and I share the same sense of humor). 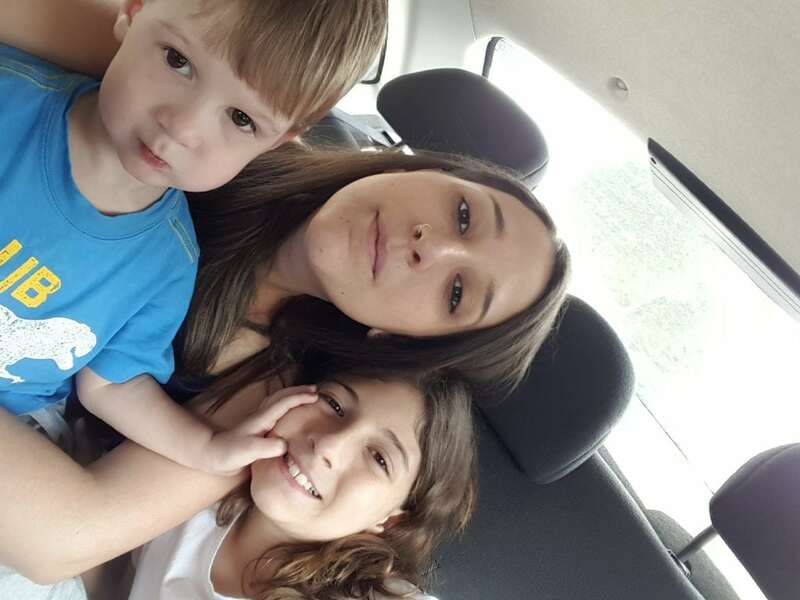 Here’s a picture of my sister Aline, my son Luke, and I, last year when I visited Brazil. I was there for her birthday actually. I made her an unicorn cake. This Almond Strawberry Cake was DELICIOUS, yes I already had a piece, because Aline is all the way in Brazil, and I am in America, so I already cut the cake so I could shoot the pictures. And even though Aline is far away, she still gets cake. And so do I.
I made some meringues to top the cake. I used the recipe by Bakerella. Some of my meringues cracked, and that’s because I had the oven temperature too high. So, here’s a big making meringue tip: don’t set your oven too high or your meringues will crack. The recipe was calling for 200F. And I let it at 250F. Don’t ask me why because I’ve made this recipe before (like in these Pomegranate Cupcakes), and other occasions, so I probably just wasn’t paying attention. 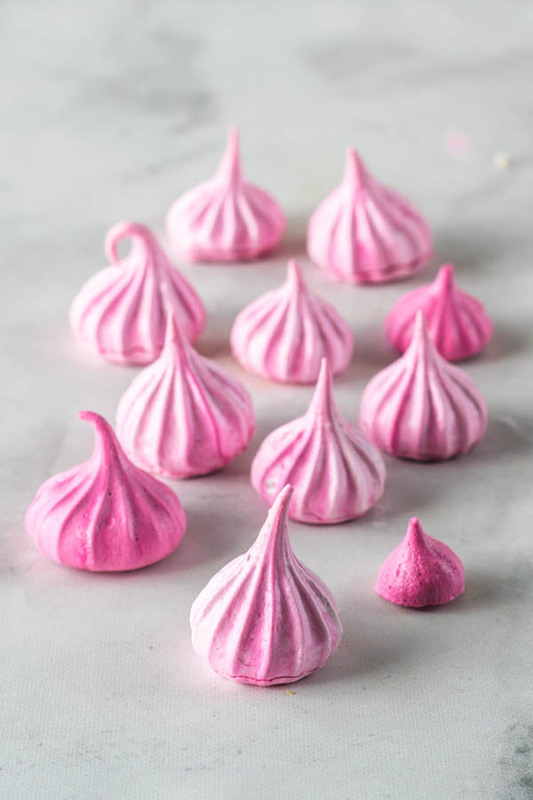 I love making meringues, they remind me of my childhood, and how I grew up in my grandma’s bakery, and meringue kisses were one of the staples at the bakery. Meringue cookies on top of cakes are the best invention ever, if you ask me. 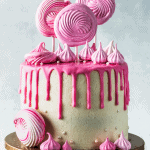 Specially the meringue pops! I loved this idea, I saw it somewhere on instagram, or Pinterest. 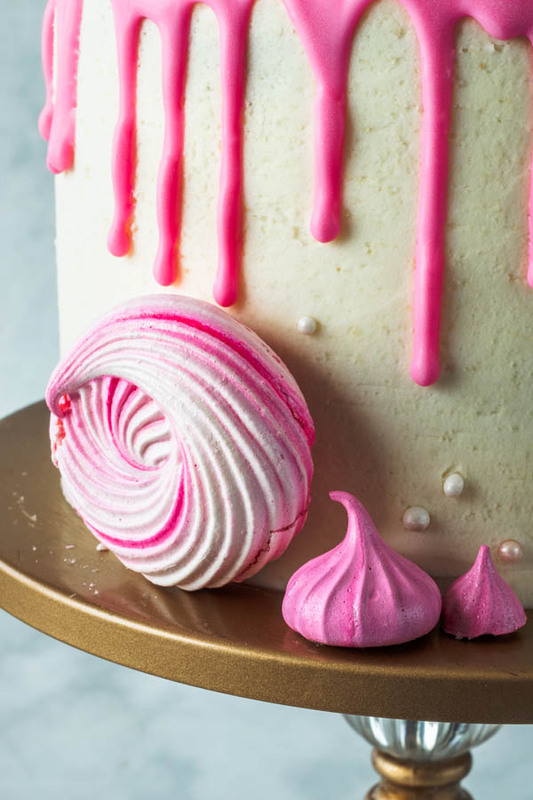 Do you like cakes with meringue on top? For the drizzle, I used candy melts. I hope you liked my special Almond Strawberry Cake dedicated to my sister. If you are interested in more Cake recipes, click here. 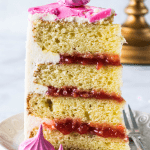 Here are some more recipes you might enjoy: Pomegranate Cupcakes, Strawberries and Cream Cupcakes, Chocolate Covered Strawberry Cupcake, Pomegranate Macarons, Strawberry Macarons, Chocolate Strawberry Cake. As always, thanks for visiting. Have a fabulous day! 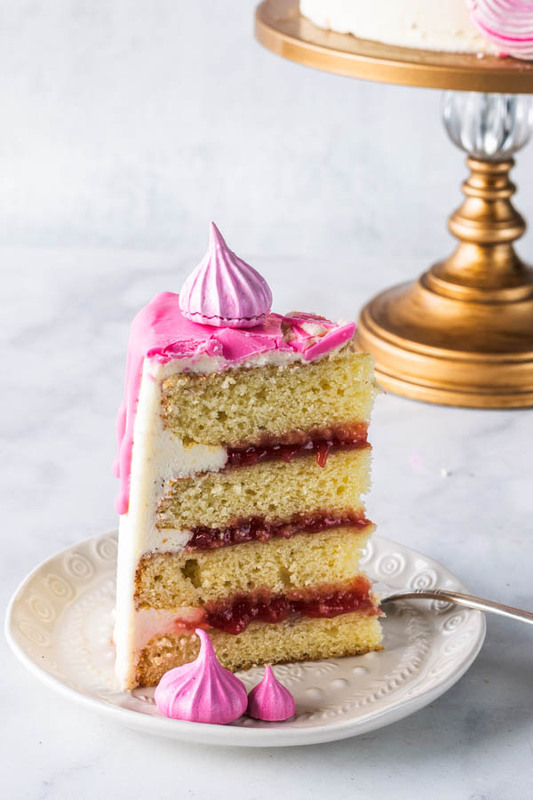 This cake has an almond sponge, filled with homemade Strawberry Jam, covered in Almond Buttercream. 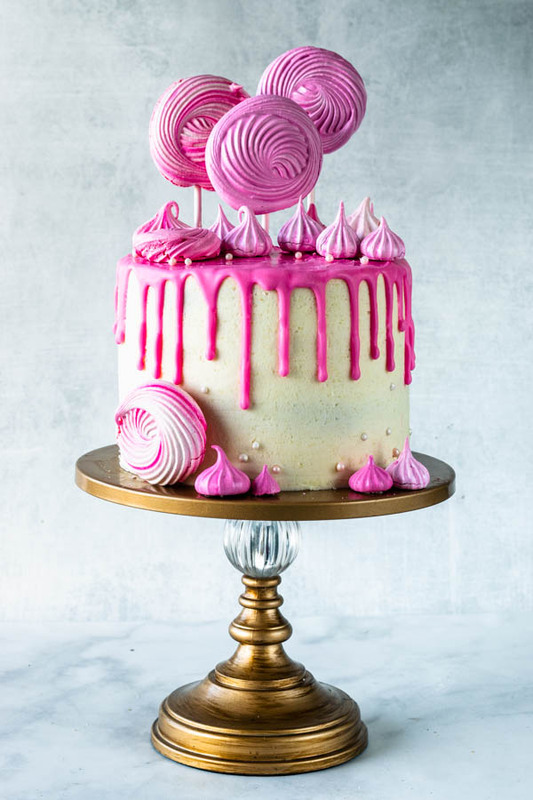 Topped with a pink drizzle, and meringue cookies. Grease and flour 4 6” cake pans, or 2 8” cake pans. Cream butter in the bowl of a stand mixer for 2 minutes, on medium speed. Gradually add sugar and cream for 3 minutes until mixture is fluffy and lighter in color. Add eggs to the mixture, one at a time, mixing on medium speed. Scrape bowl and add vanilla and almond extract. Mix on medium-low speed until incorporated. Sift flours, baking powder and salt. Add half of the buttermilk to butter/egg/sugar mixture. Mix on low for 30 seconds. Add half of sifted flour mixture. Mix on low for 30-45 seconds until almost entirely incorporated. Add remaining buttermilk and mix on low for 30 seconds. Add remaining flour and mix on low until incorporated. Divide batter evenly between your cake pans. Bake on pre-heated oven for about 20-25 minutes. Smaller cake pans will take less time to bake. Remove cake from the oven when a toothpick comes out clean once inserted in the cake. Let cake cool in the pan for 5 minutes and flip it over in a wire rack to let it cool completely before proceeding with frosting and filling. Place strawberries, and sugar in a small saucepan. Bring to a boil over medium heat, stirring constantly, and let it boil for 5-10 minutes. If the mixture is getting too thick, add a tablespoon of water or so. Let mixture cook down, regulate the heat to keep it at a gentle simmer. Once mixture has cooked down and it’s syrupy and the sugar has melted, you can dissolve the cornstarch in 1/4 cup of water and add that to the strawberry mixture, stirring and cooking over medium heat. Let mixture simmer and get thick, for about 10 minutes. Add the remaining 1/4 cup of water if necessary. Remove and let mixture cool down in the fridge all the way before using it. Start by sifting the powdered sugar and almond together. Set aside. Make sure the almond is finely ground, so you can have an easy time frosting the cake. Cream the butter with a mixer, at medium-high speed, for about 2 minutes. Add powdered sugar and almond flour. Mix on low to combine the dry ingredients and the butter. Raise speed and cream mixture for 1-2 minutes, until fluffy. Add heavy cream, as necessary. I always check the consistency first, and see if it even needs the heavy cream. The thing is that depending on how you measure your powdered sugar (by scooping, by weighing) you might end up with a totally different amount than what the recipe calls for, which is why is so important to use a scale when baking. So, if you accidentally measured too much powdered sugar, your buttercream might be stiffer, and might need more cream. Start with one tablespoon and see where it leads you. Always keep your buttercream covered, because this is the kind that forms that crust, and you don’t want your frosting to form the crust before you put it on the cake. The buttercream can be stored in the fridge for up to 1 week, and in the freezer for up to 1 month. Make sure to let buttercream come to room temperature and then rewhip it before using if you refrigerated, or froze it. I always like to frost my cakes when they are cold, so they will hold up nicely during the process of decorating. Since I like my cakes very moist and fluffy, refrigerating them really helps with having a sturdier cake when it’s time to assemble. First step is to place one cake layer on a cake plate, or board. 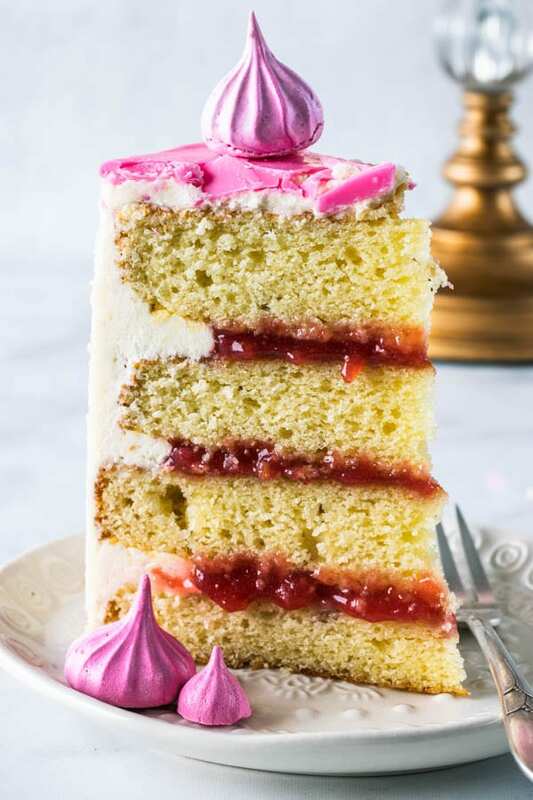 If using simple syrup*, brush some on the cake layer. Place some of the Almond Buttercream in a piping bag fitted with a round tip. Pipe a ring of frosting around the edges of the cake. Spread some of the Strawberry Jam in the middle. Top with another layer. Repeat with all layers. Cover the cake with some of the almond frosting, I like to do a crumb coating at this point and just frost my cake with a layer of frosting. Then I let my cake rest in the fridge until the frosting has set. That’s when you come in with the second layer of frosting, and the finishing one. We do this crumb coating process so the cake won’t have any crumbs on the final frosting. 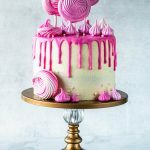 I decorated my cake with meringues made using the recipe from Bakerella, and made the drip with candy melts. Keep cake stored in the fridge, preferably covered, for up to 1 week. *Simple syrup is equal parts of sugar and water brought to just a boil, and then cooled down. I use it to brush on my cakes to keep them moist. I usually make a large batch of simple syrup and keep it in my fridge for when I make cakes. Simple syrup will last quite a bit in the fridge if you keep it safely. Don’t let any cake crumbs in it though, or you it will mold. Que bolo maravilhoso Ca, a Aline e todos nós ficamos muito felizes com essa homenagem, parabéns pra você Ca!!!!!!!! I’m so excited to have come across your blog! Your Pomegranate Cupcakes, the vanilla cake base looks like pure perfection! I’m dying to try everything; your buttermilk cake, funfetti, and this post especially! Hey Sharon thank you so so much!!! I am also a bit picky when it comes to extracts. I only use vanilla, and almond extract. I don’t care for any of the citrus extracts, or anything like that. Currently I actually have some banana extract someone advised me to try, so I am going to give that extract a try. It’s pure too, so let’s see what comes up. And the answer to your question is, my favorite brand of almond extract is Nielsen-Massey, their pure almond extract. But always remember that almond extract is potent so a little bit goes a long way. I’ve never tried making this with almond paste. Almond paste is such a delicious ingredient and I dont work with it enough. Now I am really curious about this cake you mention. I have searched on google but couldnt find it, and I never heard of it. Do you have a picture of it you can send it to me or a link to a website? If you have a pic and you’d like to send it to me, my email is camila@piesandtacos.com It sounds absolutely delicious!!! And I love figuring out recipes too! lol it’s so much fun! I’ve never put almond paste in a cake, only in pastries. I worked at a jewish bakery and we used almond paste for cookies, those traditional jewish almond horn cookies, and also in a flaky pastry. But now I am very curious to try it in a cake. I will definitely keep this in mind. Thank you so much for writing!! I really appreciate it!! !